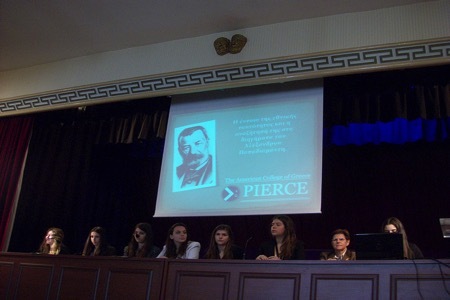 Pierce takes part every year in the Student Conference that is organized by the Ζografeio Lyceum of Constantinople, with tributes to Greek writers. Our students represent the College, study and present aspects of the works of writers such as Elytis, Papadiamantis, Kavafis, Seferis and Vizyinos along with their peers from other schools in Greece. They take part in literary discussions, listen to recitations by poets and actors, talk with contemporary researchers about the work of each writer as well as with their peers from other schools in Greece and Istanbul. In addition, they attend theatrical performances, artistic and musical events, take a tour of Agia Sophia, the Underground Palace, the Pera district, the Monastery of the Pantokrator and the Monastery of Chora. They taste local foods and sweets, take a boat ride on the Bosporus and attend the Divine Liturgy in the devout atmosphere of Byzantium, with the Ecumenical Patriarch Bartholomew officiating. In this way they combine the experience of a conference with the magic and unique beauty of Constantinople and, at the same time, they get to know what remains of Hellenism in Istanbul. The Student Conference of 2016 took place in Thessaloniki (Mandoulides Schools) from March 20 to April 3, 2016.